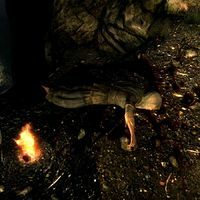 Bretons are unnamed and deceased Bretons scattered around Skyrim. These Bretons are all male citizens and wear randomly determined farm clothes (7 variations) or a belted tunic, a pair of boots (4 variations), with a 50% chance for a hat (3 variations). Additionally there is a slim chance they may carry a lockpick and a small amount of gold. Stony Creek Cave, in the entrance. Rannveig's Fast, inside a cage in Sild the Warlock's chamber. Sunderstone Gorge, locked inside a cage near the Word Wall. Cidhna Mine, on the floor next to a table. Cidhna Mine, at the entrance to a small dead end off the main cavern. Soljund's Sinkhole, at the bottom of a sinkhole. Fort Greenwall, in front of a fire in a kitchen. Lost Tongue Overlook, inside a cage. Nilheim, on a rock near the tower. Yngvild, in Arondil's throne room. Lost Tongue Overlook, just outside an open cage. Bloodlet Throne, on a single bed in a bedroom. Cronvangr Hall, on a table in a small building. 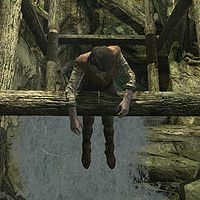 If Dawnguard is installed, another dead female Breton will be added to the game. 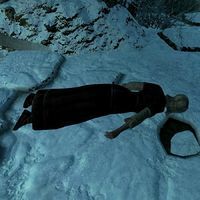 This female Breton can be found in Darkfall Cave. In addition to her outfit and inventory (which are also randomly determined as listed above), she also carries a Darkfall Cave note. This page was last modified on 26 August 2017, at 12:55.